Solid wood hutches offer such beauty along with creative storage units. 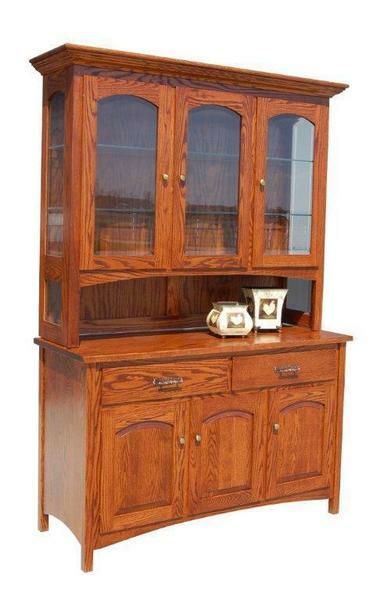 The Amish Country Shaker Hutch turns up the warmth with lovely arches on the raised panel doors and lovely cabinet doors that invite you to admire. Two drawers are spacious and ready for candles, silverware, cloth napkins, placemats and more. The Amish Country Shaker Hutch is custom made. Have fun selecting the options to create your dream furniture. The beauty and versatility of shaker style furniture makes it a favorite for many households. You can design the hutch you're wishing for. Email or call us today to get started. Thanks for shopping DutchCrafters.